Can fasting improve blood glucose levels and reduce the need for diabetes medications? Antonio Martinez was eager to find out, so he set out on his own n = 1 experiment. Antonio is an Attorney at Law (Martindale Hubbard Distinguished Rating and in The Legal Network Top Lawyers in New York) and businessman who worked for the late Dr Robert C. Atkins MD in government relations and appeared on his radio show in the 90s. Antonio was one of the principal lobbyists and strategists involved in the passage of the Dietary Supplement Health and Education Act of 1994 (DSHEA) and has been involved in health care issues in law and policy throughout his career. Back in the 90s Antonio adopted a low carb approach to lose weight for a time but says he then resumed a more moderate diet. It wasn’t until Antonio started to have his own health issues, including type 2 diabetes and a heart attack, that he realised he needed to intensify his efforts. Antonio has a family history of Type 2 Diabetes, with both his mother and father suffering from the condition. Diagnosed with Type 2 Diabetes in 2002, Antonio was initially put on Metformin and eventually Janumet in 2008. With the help of anti diabetic medications Antonio maintained a HbA1c in the 6s and was commended for his great blood glucose control. However even though he kept his blood glucose under the American Diabetes Association recommended maximum HbA1c of 7% Antonio was still at risk for cardiovascular disease. As shown in the chart below, people with a HbA1c of less than 5.0% have the lowest risk of cardiovascular disease and stroke, however it doesn’t seem to count if you are using anti-diabetes medications to reduce blood glucose levels as they simply drive the excess energy back into storage as fat. While anti-diabetic medications help to lower blood glucose levels (the symptom) these medications do not necessarily reduce your disease risk or allow the fat in your organs (the cause) to be released to restore insulin sensitivity (the solution). Insulin is an anabolic hormone which means that it enables the body to build energy stores. If your problem is hyperinsulinemia, Type 2 Diabetes or fatty liver then your goal should be to lower your blood glucose and insulin levels to enable your stored body fat to be used for energy. Medicating high blood glucose without dietary changes will drive the energy back into storage as fat (including in your heart, liver and pancreas). The diagram below from Dr Ted Naiman helps to explain how both high insulin levels (hyperinsulinemia) and high blood glucose levels (hyperglycemia) are interrelated and both bad news. 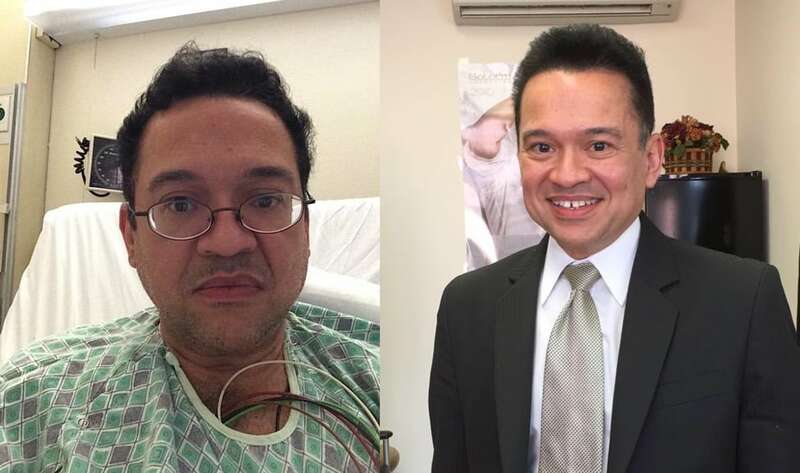 Sadly, on March 28, 2014, Antonio suffered a heart attack and had a stent placed in one artery. Upon admission to the hospital he weighed 158 lbs and had a HbA1c of 7%. After the heart attack Antonio was prescribed aspirin, blood pressure medication, a statin, an anti-coagulant, and a beta blocker. Within a short time he began to experience side effects from the multiple medications. Frustrated, he re-read a number of health and medical materials and told his doctors he would not be taking medications for the rest of his life. He also watched the documentary “Cereal Killers” which was a light bulb moment for him. In July 2014, Antonio told his doctor and cardiologist that he was going on a high fat low carbohydrate diet. While his doctors did not advise against it, they were skeptical and warned him that he would have to have labs done frequently to monitor the impact of the diet. Congratulations. Whatever you are doing, keep doing it. You have a normal HbA1c! I’m taking you off Janumet. Take Metformin at the lowest dose as a control. As shown below, Antonio’s HbA1c had come down from 6.6% to 4.9% with the low carbohydrate dietary approach. He had also dropped thirteen pounds to 145 lbs, his blood pressure had normalized, his HDL increased by 20 points and his triglycerides dropped below 100 mg/dL. Despite eating only two low carb meals per day Antonio became concerned towards the end of 2015 that his morning blood sugar levels were starting to drift up. Dawn Phenomenon is the process where the body secretes a range of hormones and glucose in preparation for the day, however if you are insulin resistant then the insulin response may not be adequate to maintain normal blood glucose levels. Having already experienced a heart attack he took this seriously and was eager to do whatever he could to reverse the situation. So to kick off the new year Antonio adopted a regular fasting regime which involved going to bed without dinner on Sunday night and then not eating until Tuesday evening. This gives him a 44 to 48 hour fasting window each week. The chart below shows Antonio’s blood glucose numbers through December before the fasting protocol and then through January and February with the fasting protocol in place. Real life blood glucose numbers are always going to bounce around, however you can see that Antonio’s average blood glucose values have really improved. I am getting the best numbers that I’ve ever had and no Dawn Phenomenon. While the longer fasts are working well for Antonio he could also use shorter more regular fasting periods to keep his blood glucose down. Check out the Using your glucose meter as a fuel gauge article for some ideas on how you can make sure your average blood glucose is trending in the right direction. One way of viewing high blood glucose levels and Dawn Phenomenon is the body’s way of releasing excess stored energy into the bloodstream to be used. If you are insulin resistant the body will use a process called gluconeogenesis to convert excess protein, and even fat to an extent, into glucose. Once the excess fat decreases people will often become more insulin sensitive and the body will stop pumping out this extra glucose. Starting out with an HbA1c of 5.1% Antonio was already doing pretty well due to his disciplined low carb approach. However the addition of the fasting protocol helped him break through the plateau and bring his blood glucose levels down even further towards optimal levels. Based on his blood glucose values he now has an HbA1c of around 4.6% which is pretty much optimal. Antonio’s ketones are solid but actually trending down after introducing the fasting regime. The fact that Antonio has lower ketones values is not really a concern given that he’s likely using his ketones more effectively for energy rather than letting them build up in the blood as might be the case with a high fat diet without fasting. I think many people get themselves into trouble chasing high ketone values by adding more dietary fat without improving their metabolism and insulin sensitivity to the point that they can actually use the ketones. Fasting forces your body to learn to use ketones for fuel. The ratio between glucose and ketones (GKI) can be a more useful measure when your blood glucose levels are reducing. A reducing GKI is an indication that your insulin levels are decreasing and your metabolic health is improving. Antonio’s glucose : ketone ratio (GKI) improves each time he fasts and that it is trending down over time. These low GKI values indicate that he is achieving excellent metabolic health. Thomas Seyfried’s GKI is a useful tool to track your metabolic health once your blood glucose values are approaching optimal levels. Seyfried aims for his cancer patients to have a GKI of 1.0, though a GKI below 10 is considered to be a fairly low insulin state and less than three is excellent metabolic health for someone not chasing therapeutic ketosis. Antonio continues to enjoy the weekly fasts during which he focuses on drinking lots of different teas, coffee, and some bone broth. His weight has now dropped to 141 pounds and he is wearing the same size clothes as he wore in college. By eating a high fat low carbohydrate diet based upon eating real food. I work to keep my food macros in the range of 70 percent fat, 20 percent protein, 10 percent carbs as my ideal targets. I do watch my protein intake because excess will convert via gluconeogenesis. I will likely maintain this approach for the rest of my life. I am loving my results! Another way to look at insulin resistance is your body telling you that you’re eating too much, eating too much of the wrong things or just eating too often. Our ancestors were hunter foragers whose eating habits were more like feast and famine, not three meals with snacks. Know and respect your insulin because it will command you to do so or otherwise wreak metabolic havoc on your health. You can also think of your blood glucose meter as a fuel gauge. If your blood glucose levels are high then it might be time to stop filling the fuel tank for a while. Intermittent fasting is like going to a metabolic gym and working out. Your body gets the opportunity to repair, recover, regenerate. Used intelligently, it will make the difference for your health and insulin sensitizing. I am disappointed in the medical establishment because they should know better and they do not. Why isn’t clinical and therapeutic nutrition education mandatory in medical school and taught with the same emphasis as pharmacology? And before go thinking Antonio is a saint that loves deprivation, he likes to feast too! Here he is with Ivor Cummins at Antonio’s favorite New York restaurant with some red wine..
…and Le Côte de Beouf. Lots of people would call this a ‘heart attack on a plate’, but for Antonio it seems to be working the other way. Here’s the blood glucose and ketone results the next morning. And here’s Antonio recently on the job full of life and vitality. Is Antonio cured of his type 2 diabetes? The answer depends on your definition of “cured”. Will Antonio be able to eat processed junk food five times a day? Probably not. However if Antonio keeps up this fasting protocol along with his low carbohydrate approach then he just might be able to maintain optimal blood glucose levels without fear of another heart attack. If that’s your definition of “cured” then the answer might be yes. Congratulations Antonio and keep up the great work! I was “undiagnosed” type 2 approx a decade ago, but had chronic stress for many years and forgot about managing Blood Glucose. When I did have a blood test last quarter 2015 my HbA1c was 16.1 and fasting 20.2. Next test this year my HbA1c was 5.5. I did this myself with lifestyle management and the helpful information from blogs such as this. It is very motivating. I am 60. I did come in with increased lipid profile ( really a heart attack as the doc. said) as the next hurdle, but have not taken the prescribed Crestor. I have increased the fasting duration, even out to 5 days and as well rebalance my gut microbiome and eat a liver friendly diet with more fibre and greens. I am meds free for diabetes. Lets see what the Chol results are next time but I believe we need to really consider the gut health more now alongside LCHF and intermittent fasting. I have started making my own sauerkraut, and will start making Kombucha tea, and Kefir along with what else fermented foods I choose to make. I was 112 kg first test and last week 93 kg. Target 72 kg. I will have another improvement in HbA1c next time as well. If anything I stopped my first 5 day fast because my Blood Glucose was down to 3.6. Ketones were 5.5. I felt fine however and next time just stopped at day 5 but could have continued. I workout fasted as well and my weights have increased through the period. I manage myself, what I do and really have to if I want to be healthy. Thanks to these blogs for giving me the information to make helpful choices and for the motivation it is the correct solution. He was close to the greatest LCHF MD of his time and even being a highly educated lawyer he couldn’t keep to it for another couple of decades? What possible chance do we have of convincing the average person about this? Glad to hear he’s getting better. Does he rue the years he ignored the good advice? I was wondering that myself, I guess he fell off the wagon! Bet he is rueing it – but better late than never to climb back on. I am so glad they question the word “cured”. I always worry about ” cured” people going back to the typical diet. No can do. But reversed symptoms are a big deal! Congratulations, Antonio, and well done!! Very inspirational and informative article. Mr. Martinez, Congratulations! Check out Dr. Richard K. Bernsteins Diabetes Solution book. Thanks for your story!